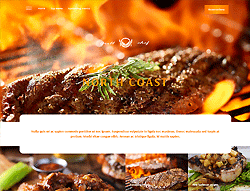 Grilling barbecue will never be the same with this tasty-looking Joomla template. The responsive design makes it easily adaptable for all screen resolutions. The stylish and easy to use admin panel together with a wide range of customizable features enables the creation of an elegant looking site. It is designed with a cafe and or restaurant in mind to give you that feel-good experience. This template deviates from the normal design i.e. menu, slider, body and footer. Instead, it features a static image, two different and independent menus, unique body layout and so much more.